Cup point set screws are the most commonly used set screw style today. They consist of a headless screw threaded the entire length, along with a hexagonal drive at one end, and a cup-shaped indentation at the other end. Cup point set screws are designed for fast, permanent and semi-permanent location of parts on shafts with hardness differential of 10-15 Rockwell C points and where cutting in of the cup edge on the shaft is acceptable. 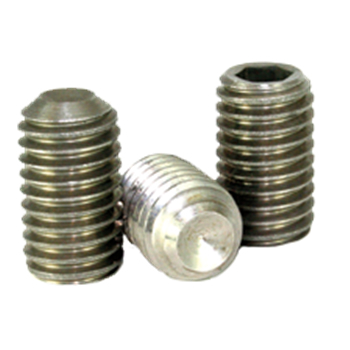 RC Fasteners & Components is your number one source for cup point socket set screws in alloy, Ni Cu alloy, brass, 18-8 stainless, 316 stainless, in black oxide, zinc or mechanical zinc coatings. Also available from stock are cup point set screws with a nylon patch, nylon pellet or as a locking jam screw.